Would you love to stay at Wolfe's Neck but want a real bed? 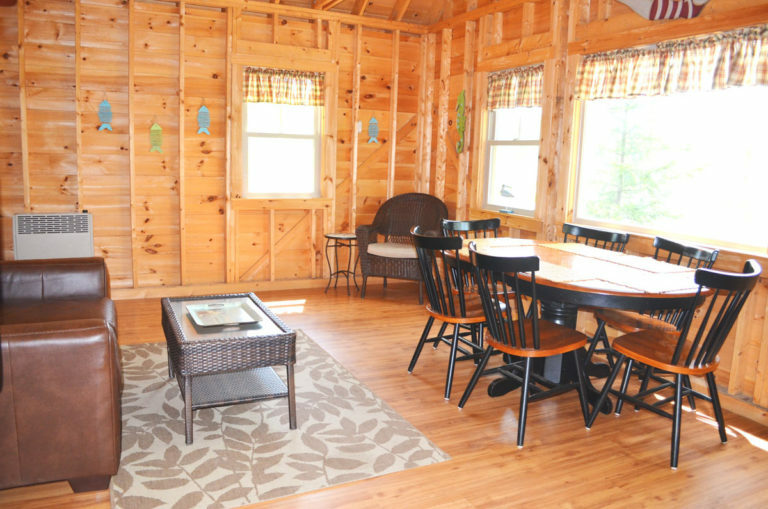 Our camping cabins are the perfect blend of camping and comfort. 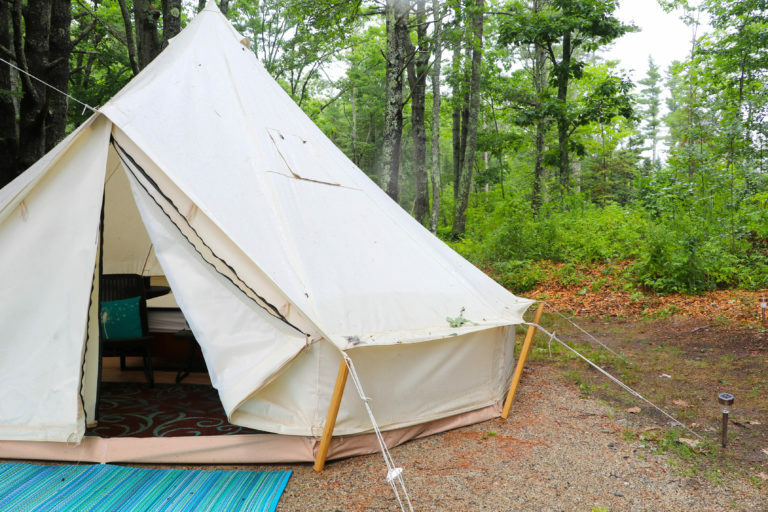 Some may even call it glamping. 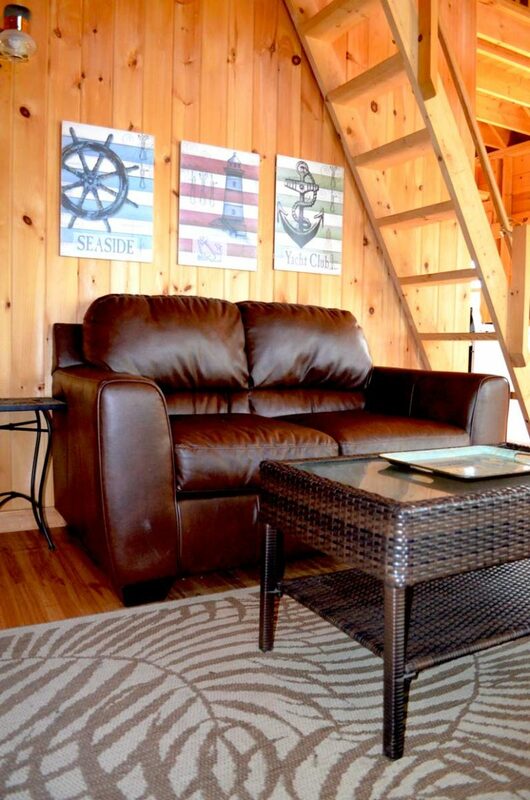 Our three oceanfront cabins are equipped with electricity, heat, running water, and lights. 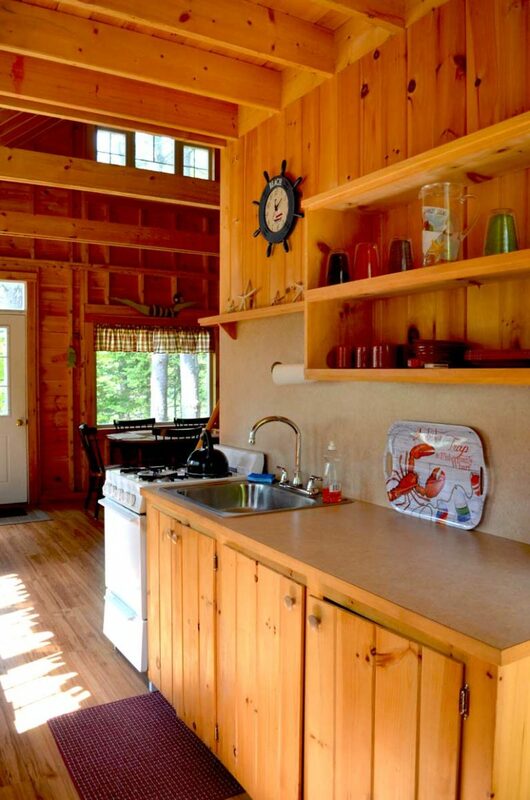 A full kitchen includes refrigerator, stove and oven, microwave, coffee maker, place settings for six, and even lobster pots. Comfortable furnishings make even the rainiest day a joy. 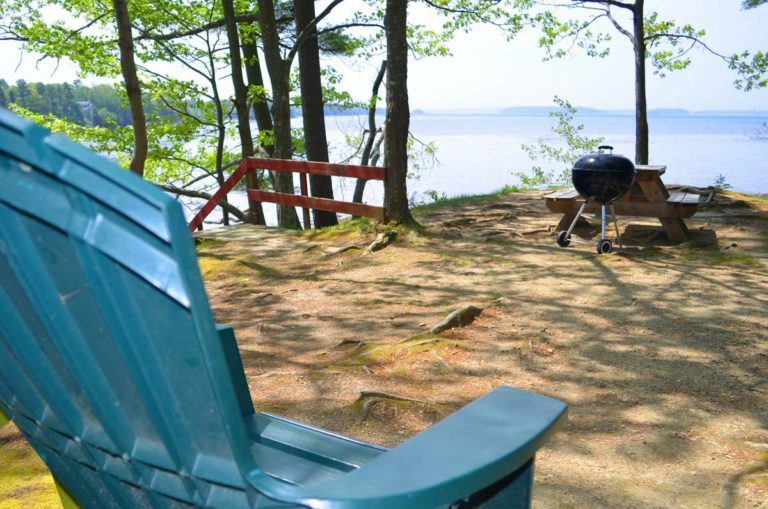 Outdoor gas grill, picnic table, fire ring, and Adirondack chairs allow you to make the most of the ocean breezes and gorgeous views. It’s still camping, of course! 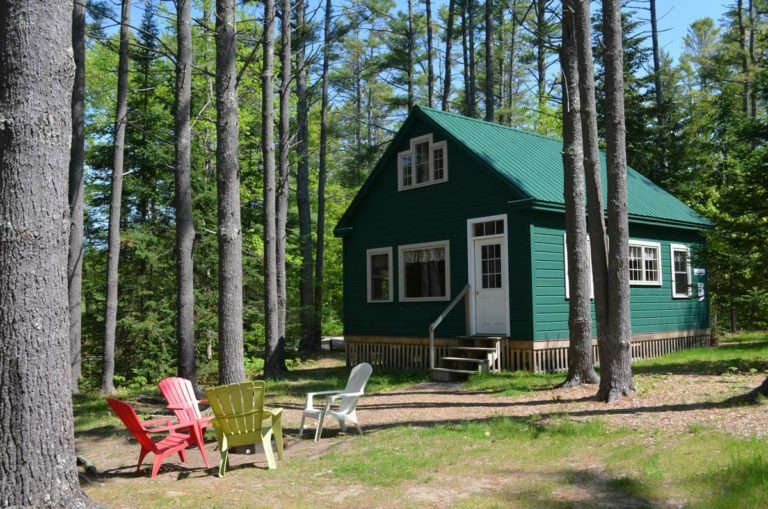 Cabins have semi-private access to low-flush outhouses, and you’ll need to bring your own bedding. 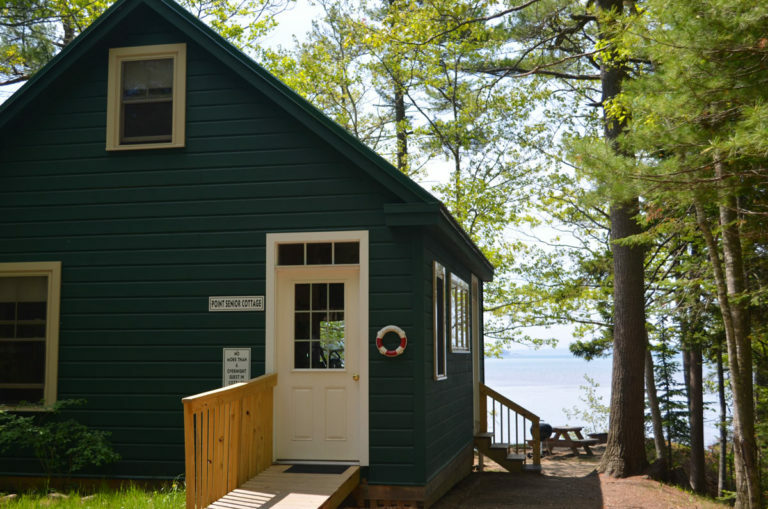 Up to two very well-behaved dogs are welcome in cabins for a fee (must not be left alone). 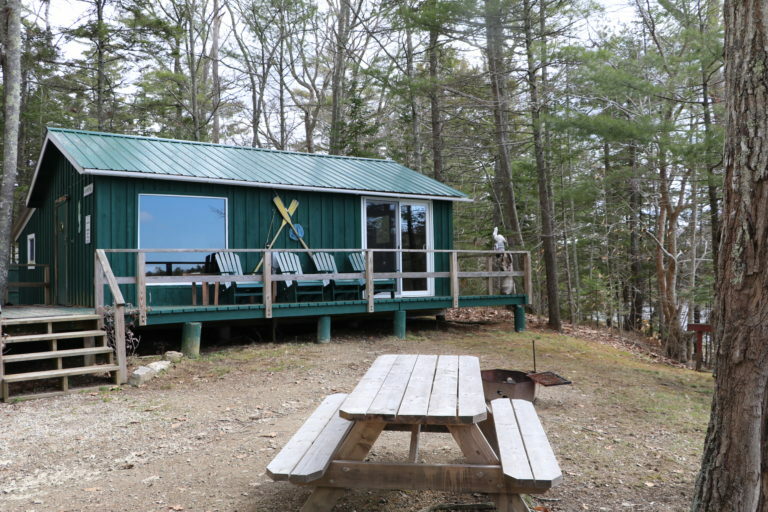 Set on its own private lot, this traditional Maine cabin offers sweeping ocean views and private stairs down to the rocky shoreline. A great room offers lots of space to spread out, and a patio provides outdoor seating with a view. Bedroom has two queen-size camp mattresses, and there is a twin-size cot as well. Built in 2014, Cove and Point Senior have similar layouts. Galley-style kitchen opens into the living/dining room. 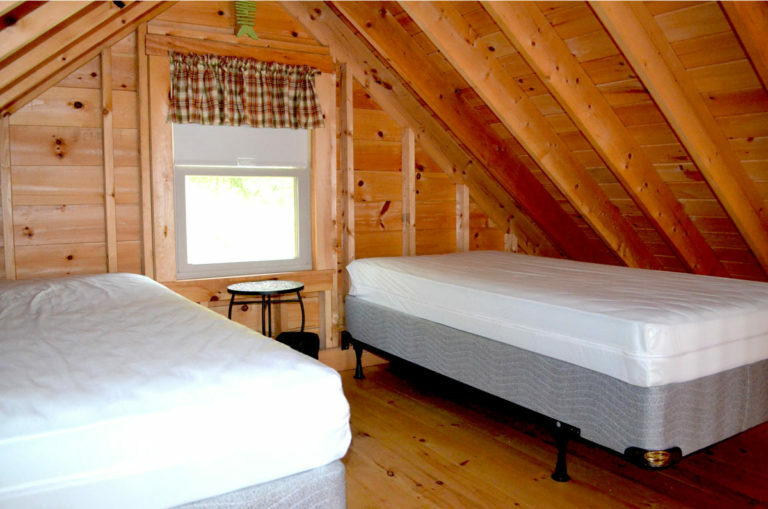 Bedroom features a queen-size pillowtop bed, and twin-size bunkbeds. 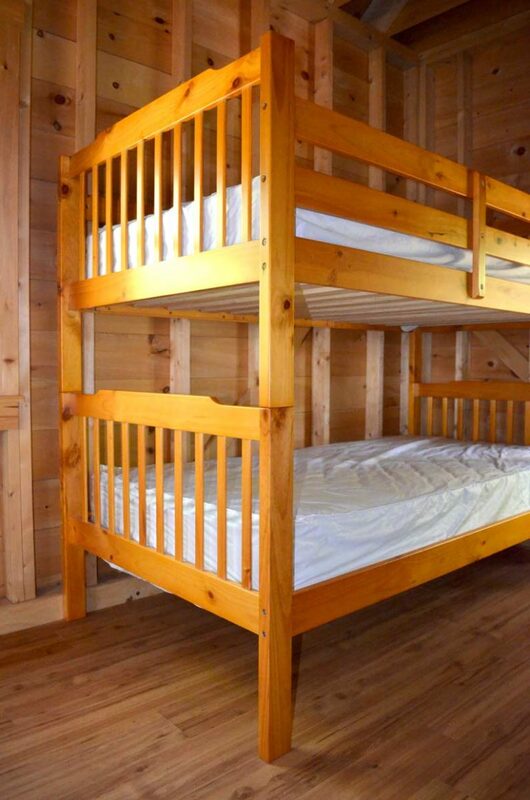 The sleeping loft (up a ladder) offers two additional twin beds. 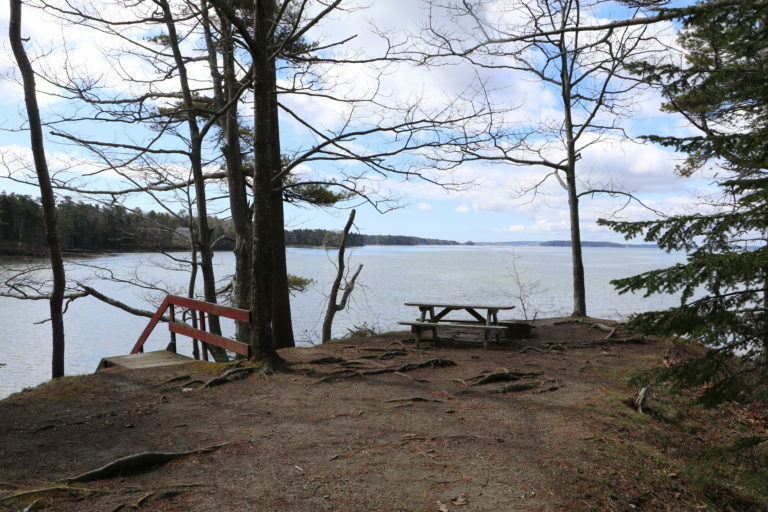 While they both have lovely views, Point Senior has the additional benefit of a campfire out on the “point” as well as private stairs down to the rocky shoreline. 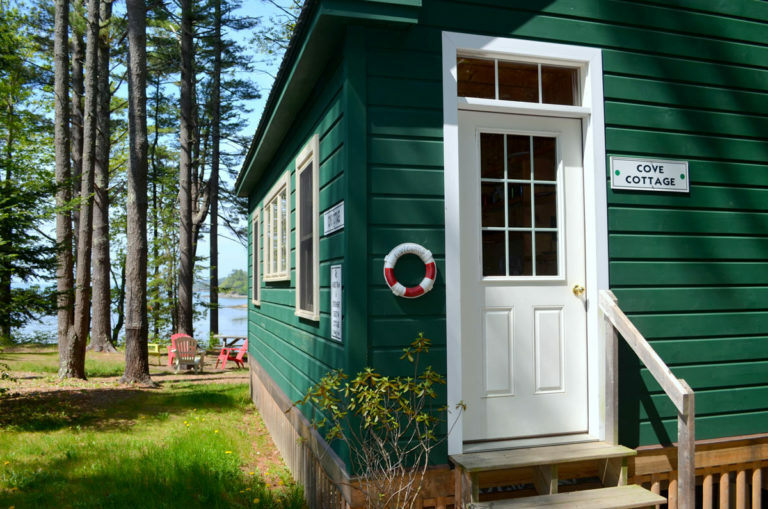 Our cabins are fully booked for the summer, so we’ve added a new option: Comfort Camping! 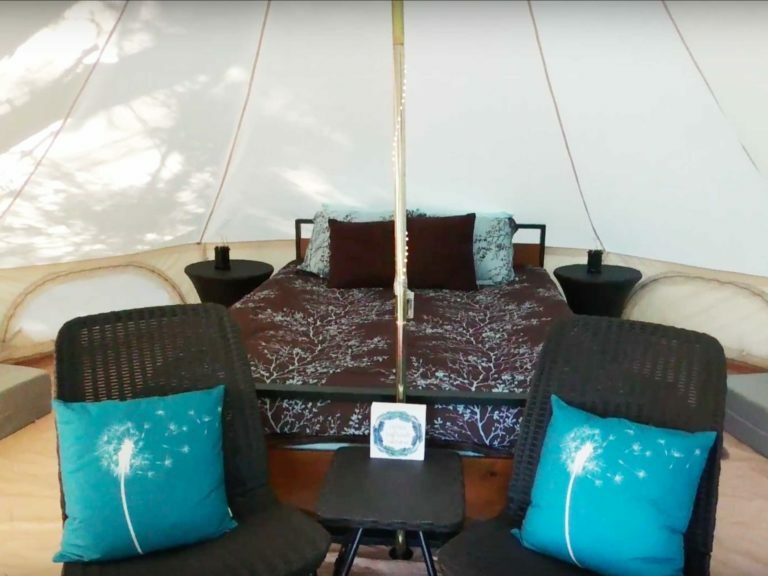 Our new 16′ canvas bell tent sleeps four with a queen size bed with memory foam mattress with bedding, two twin size fold out foam mattresses with sleeping bags. 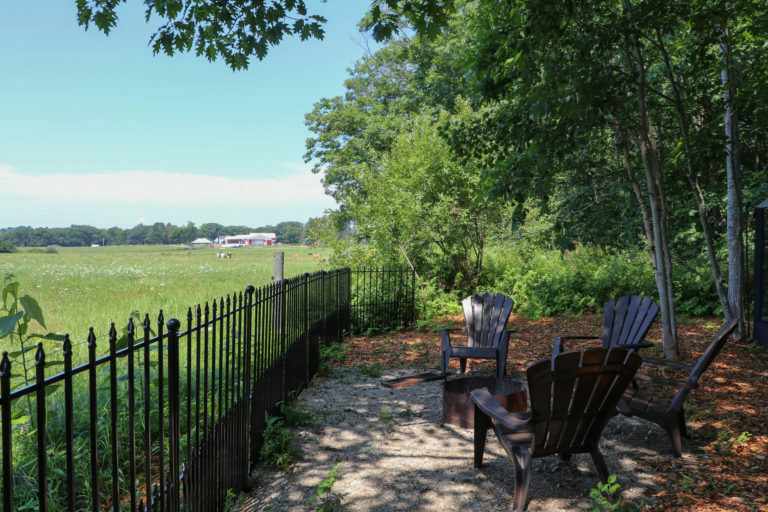 Set in a large, private site in a wooded area in East Bay, this site offers a distant ocean view. 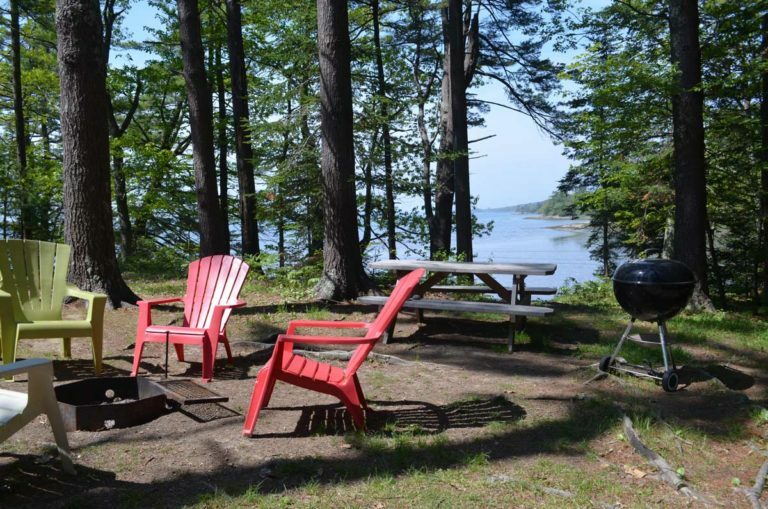 Equipped with a gas grill, camp stove, seating and place settings for four under a screen canopy. Just pack your cooler and clothes, and come enjoy camping in comfort! Two-night minimum, no pets at this time. 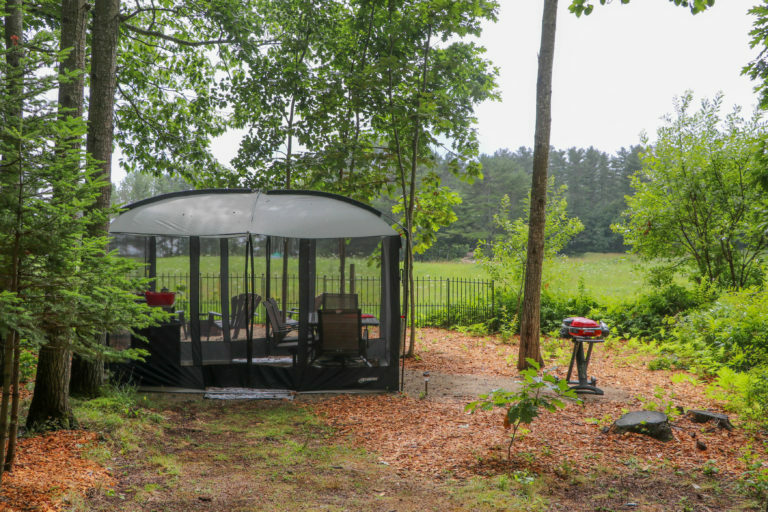 Includes private outhouse.